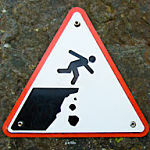 There are plenty of signs that a significant number of physicians are walking on the edge of a cliff at work. 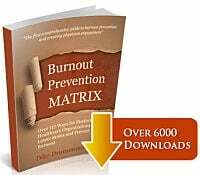 If you look at this year's Medscape Physicians Lifestyle Survey, 46% of those 19,000 doctors are already suffering from burnout symptoms. Even more are on the verge. Will ICD-10 be the tipping point in your practice? Experts tell me that ICD-10 could mean an hour or more extra work in your day starting October 1st. I am very suspicious you don't have that kind of time just lying around in your practice. In this post I will show you why I think ICD-10 may be the tipping point for many physicians - and what you can do now to avoid that fate. Here is the relationship between stress and productivity. It is a classic bell shaped curve. 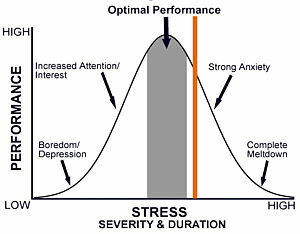 The orange line on this version of the stress vs productivity graph is where many doctors sit now. Hopefully that is not you. You can see it does not take much to push you over the edge. I have interviewed several ICD-10 implementation consultants recently on the additional time it will take the average doctor to deal with ICD-10 's and their answers are downright scary. Here is what I learned from Stuart Newsome, VP at Alpha II ( www.alphaii.com ) a publisher of coding books and revenue cycle software including Alpha II Code Search and Code Wizard products. NOTE: I have no financial relationship with Mr. Newsome or Alpha II. In order to code accurately in an ICD-10 universe you will need to master whatever software your EMR uses to look up the new codes. 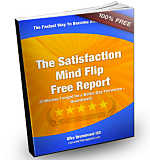 That's right - learn to use new software and algorithmic search tools. You can't flip through a book and look these codes up manually. If you code your own charts, this will take 1-3 minutes extra (and more) per patient - at least for the first couple of months until you get used to the new ICD-10 system. Your current dictation does not give your coder the amount of information they need for an ICD-10 world. They are going to be bringing multiple charts to you every day for clarification on the details they need to assign the complete and accurate ICD-10 code. What a pain. Let's make sure you are NOT one of them ! What can you do to prepare ? FIRST, learn everything you can about ICD-10 and how it will be implemented within your EMR in your practice. - Create your own ICD-10 implementation action plan. This will guide your preparations between now and 10/1/2015. Here's the Road to 10 website from CMS to guide you through the process. - Get with your IT team and EMR vendor and take the trainings on ICD-10 ASAP so you are ahead of the curve. - Master the ICD-10 lookup software that will be built into your specific EMR program for the patients who don't fit into your hot list. Know how it works and the quickest path to a final answer. - If someone else codes for you, learn the specific severity, location and cause requirements for full coding. Start adding them to your routine dictation habits now. Since ICD-10 is unavoidable, the key here is to make room in your documentation routine NOW. - ICD-10 has a learning curve. 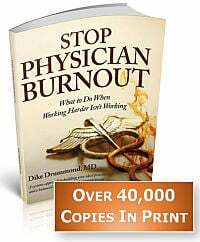 - But that does not have to push you over the edge and into physician burnout. What can you do about your charting process now that will free up the time and energy you will need for ICD-10 when it hits? Here are several specific recommendations we have tested in hundreds of physician practices in all specialties. What is the biggest challenge you face with documentation? What impact do you think ICD-10 will have on your practice?